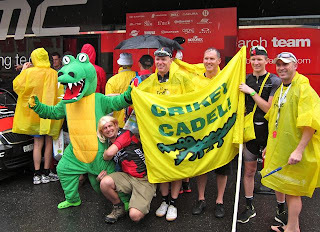 Thunderstorms in Toulouse last night heralded a wet day for the peloton for what is a short 168 km stage from yesterday's finish point to the today's finishing town of Lavaur. Two minor climbs on a short stage was never going to be anything but a bunch sprint, despite the very wet roads. 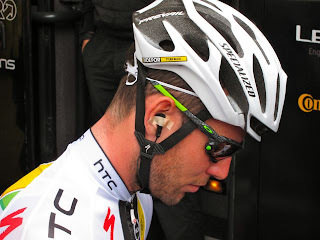 The HTC train did a fantastic job of delivering Cav for a reversal of yesterday's victory over Andre Greipel. 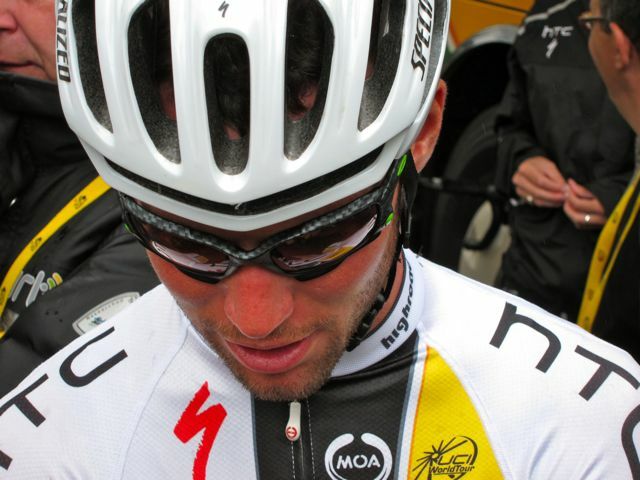 Cav was a very happy boy to don the Maillot Vert today. Great to see Mark Renshaw on the front from 400 m out and ripping the speed to maximum in the rain-soaked finish to give Cav the speed he needed to hold off Greipel this time. We left Toulouse in the bus today in the rain with a forecast for a very wet day. We arrived at the start town of Blayes les Mines with the welcome of a slight drizzle so we were hopeful of being able to ride to the intermediate sprint at Gaillac and then cut across country to the finish at Lavaur. 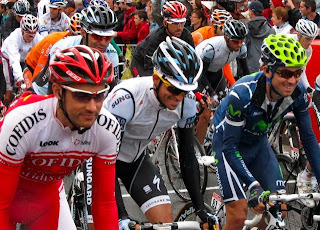 Sadly, the rain increased and we decided that once we had a chance to view the start that we would take the bus back to Toulouse and watch the finishing 50 km or so in the comfort of our hotel. Despite the rain and lack of riding there were some real high points for us today. 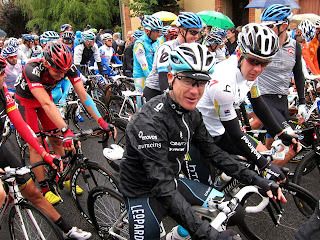 We were very up close and personal with the riders before the start as the crowd was much smaller than normal due to the rain and our bus was parked right in the same street as the rider's buses. So lots of great photos. On top of this, we arrived back to Toulouse to find that Radio Shack and Europcar were booked into our hotel in Toulouse....again lots of great photos. Enjoy the pics. 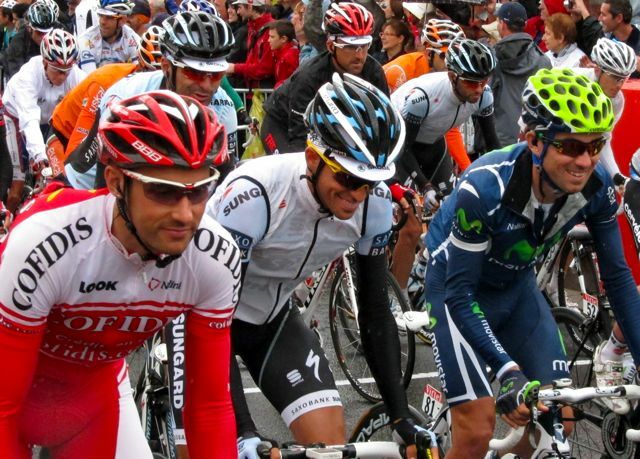 Tomorrow we jump on the buses nice and early and head to our new hotel in Lourdes and then ride to the summit of Luz Ardiden to see the finish of tomorrow's stage. 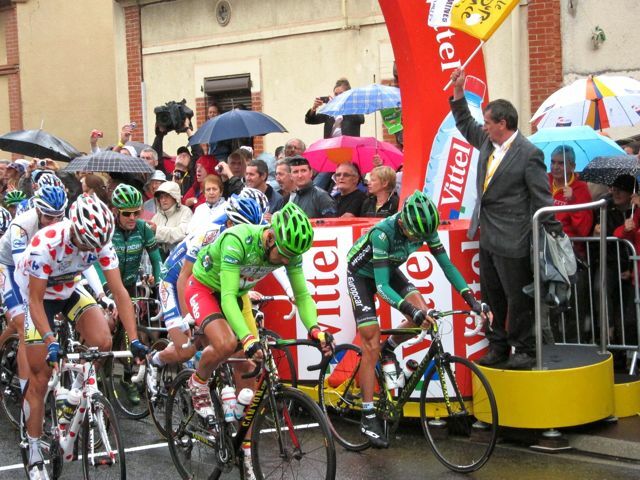 This is where the real battle for the Maillot Jaune begins!! 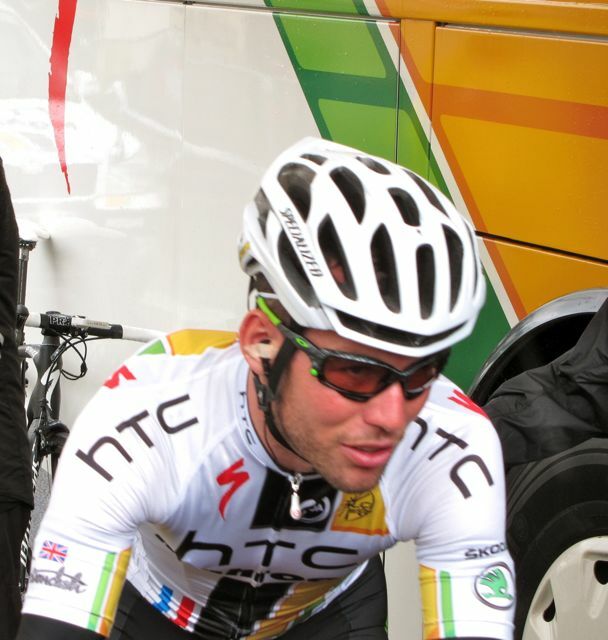 C'mon Cadel!! These great shots below are courtesy of out team photographer Mark, he's doing a great job to poviding a real feel for this year's tour. These guys we up and down the street in the rain all morning and were interviewed by SBS, maybe you saw them on the Aust coverage today? Cadel came out of his bus to say G'day and sent one of his soigneur's out with a round of espresso for them all...great PR!! 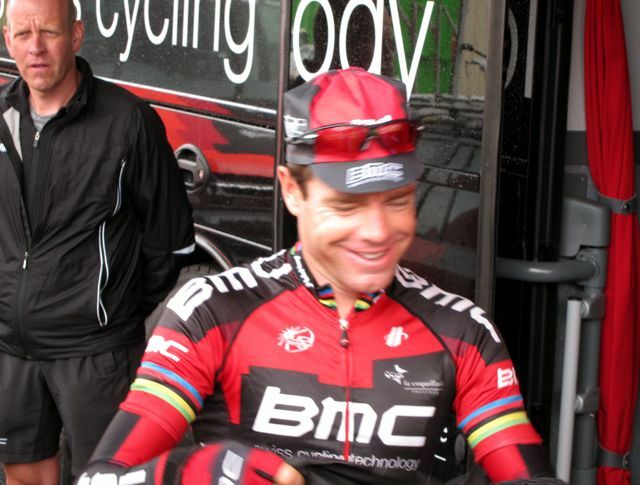 A very happy Cadel this year!! C'mon the Burgs!! I reckon Cav was feeling pretty lucky today, he was in a great mood before the start and didn't seem in any way phased by the rubbish weather. The call of "Hey Stuie" from our stealthy Mark drew a great little smile from Mr O'Grady. Even Aberto Contador didn't escape Mark's probing lens. Awesome photos Mark, and Peter it's a great review of what was a great day. Despite having our plans changed due to weather, it certainly turned out to be a fun and rewarding day.